This 120cm/48 inch working width chain harrow is mounted on a frame for standard category 1 three point linkage and is suitable for use with sub-compact and compact tractors. The main advantage for this form of mounting are easy transportation, simple removal of debris from the tines and manoeuvrability. 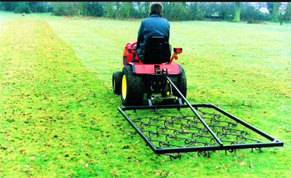 Dead vegetation can be removed from paddocks and other large areas of grass with the SCH Mounted Chain Harrow. Seed bed preparation and maintenance of horse areas can also be carried out with this harrow.